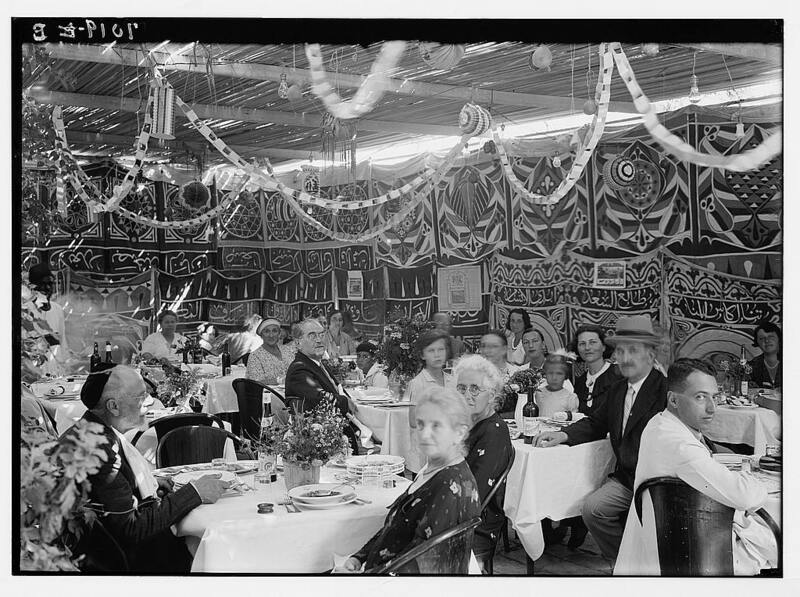 ﻿﻿ As soon as the Yom Kippur fast day is over many Jews start preparations for the Sukkot (Tabernacles) holiday. It usually involves building a sukka, a temporary structure -- sometimes just a hut -- with a thatched roof, in which Jews eat and often sleep during the seven day holiday. 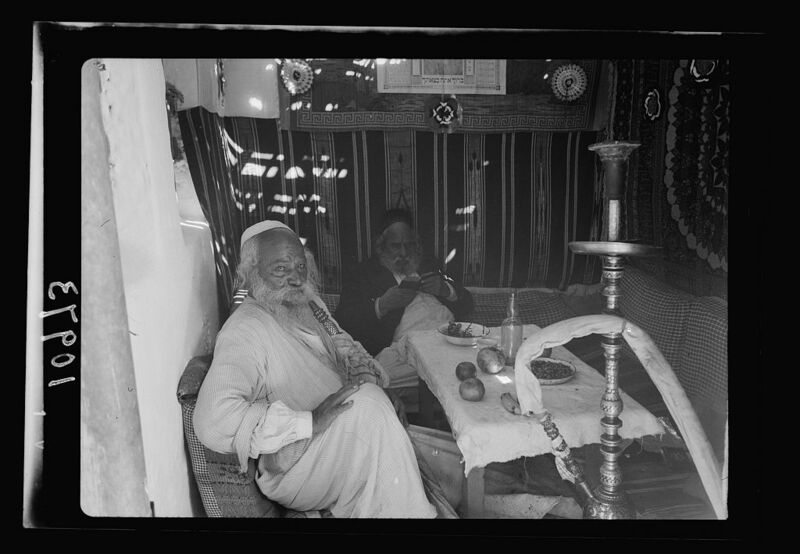 The photographers of the American Colony Photographic Department took photos of sukkot structures over a 40 year period, preserving pictures of Bukharan, Yemenite and Ashkenazi sukkot. 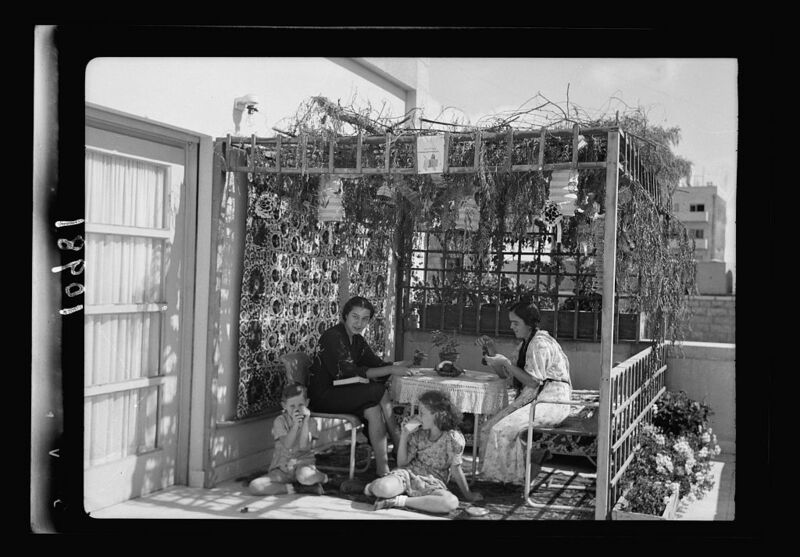 Several photographs include the Jewish celebrants holding four species of plants traditionally held during prayers on the Sukkot holiday -- a citron fruit and willow, myrtle and palm branches. 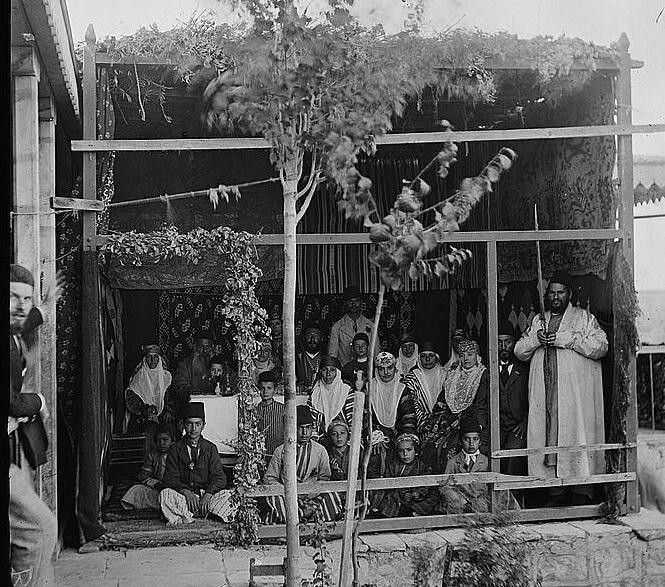 Even though the sukka is a temporary structure, some families moved their furniture and finery into the sukka, as is evident in some of the pictures. Bukhari Jews, shown in pictures from around 1900, were part of an ancient community from what is today the Central Asian country Uzbekistan. They started moving to the Holy Land in the mid-1800s. 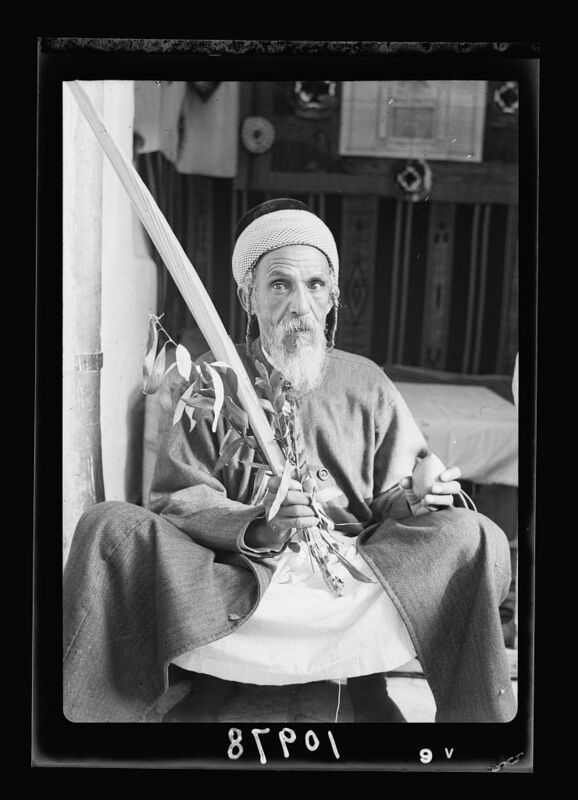 ﻿Yehia, the Yemenite Jew pictured, was almost certainly part of a large migration of Jews who arrived in Jerusalem in the 1880s, well before the famous "Magic Carpet" operation that brought tens of thousands to the new state of Israel during 1949 and 1950. 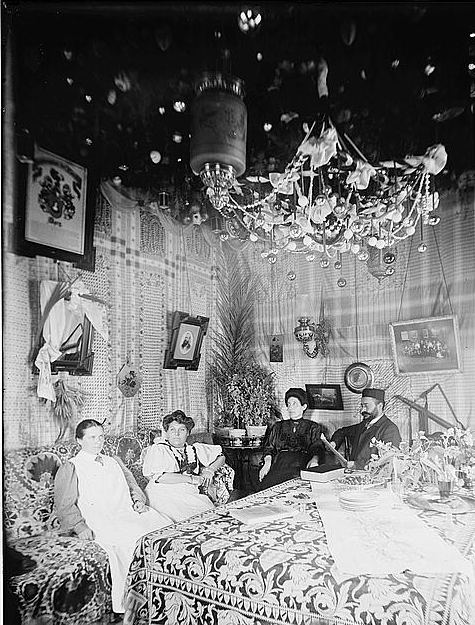 The last picture on the right, taken in a very large Jerusalem sukka belonging to the Goldsmidt family, shows the tapestries and fabrics on the wall of the sukka. Close examination shows that the fabric contains Arabic words, even some hung upside down. Several experts were asked this week to comment on the Arabic. One senior Israeli Arab affairs correspondent wrote, "It is apparently some quotes that I can read but do not amount to anything coherent, written in Kufi style of Arabic... [I] would not be surprised if these are Kuranic verses." Presumably the Goldsmidts and their guests didn't know about the Arabic phrases either. 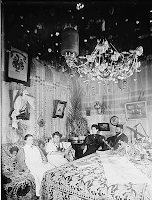 We invite readers to unravel the mystery of the tapestries, translate the phrases, and provide a contemporary picture of the Goldsmidts' building. A reader helped identify the Goldsmidts' building. 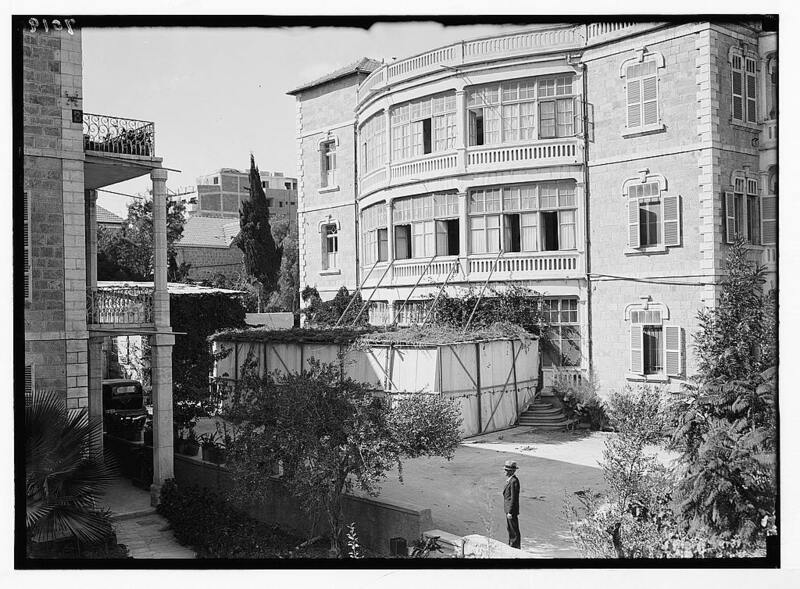 "The Goldsmidts were friends of ours who lived on Ben-Maimon Street [in Jerusalem]. They had a restaurant [and that explains the diners in the sukka]. Our wedding reception was there. There's a plaque on 54 King George Street that says "Goldsmidt Building." So it looks like some of these pictures had a sukka inside their house. So then would that be okay for me to do with my family? I mean make a sukka, let's say, my living room?